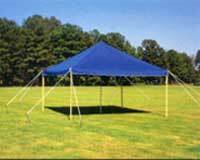 Hill & Lawn Tents are available in 15’x15’, 15’x20’ and 20’x20’. Made of Sunbrella, an acrylic nylon material that is fade and weather resistant. Double-sewn stitches with leather reinforcement in corners and top. We sew extra reinforcement around the sides for longer and stronger use. 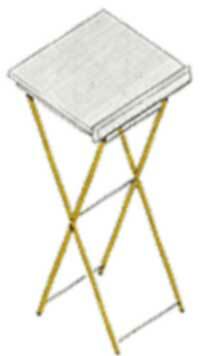 Each tent top includes hooks and straps or all straps, name on one side and a storage bag. Tops are available in many colors. Portable 15’x15’ Soft Top Roll Around is great when you have to move quickly between services. This tent can be easily assembled on location without any welding. Once it is set up all you need to do is move it around from graveside to graveside. Made of Sunbrella, an acrylic nylon material that is fade and weather resistant. It is sewn with awning ties around the side rails and reinforced with leather in corners, top and sides. The frame is made of 2” square tubing; 1 3/8” galvanized steel rafters and ¼” steel plate for the center spider. Included are 4 pneumatic tires 2 swivel and 2 locking. Tow package optional. Hard Top Chapel 14’x20’ is another solution when you need to move quickly between services. This tent can be assembled on location without any welding. Once it is set up all you need to do is move it around from graveside to graveside. The top is fiberglass and the frame is made of galvanized square tubing. Included are 4 pneumatic tires 2 swivel and 2 locking. Tow package optional. Fiberglass tops are available in green or tan. Push Pole Tent Tops are made of the same Sunbrella that we use on our 15’x15’ H&L Tents. The poles are available in wood, steel or aluminum. Ridge Pole Tents- Just like all of our other tents this top is made of the same Sunbrella material. The poles are available in wood, steel or aluminum. ACS carries a full line of Steril Tents and products. Please call our office for further information. Tent Walls are designed to protect from inclement weather or to provide additional space for flowers or equipment. Walls are made of the Sunbella, an acrylic nylon material that is both fade and weather resistant. 4 different styles available: Straight Sidewall, Northern Wall, Side Wall that converts to an Awning, or Sun Extension. All style of walls is available in many colors. Mound Covers add further protection from inclement weather. Mounds are made of the Sunbella, an acrylic nylon material that is both fade and weather resistant. 3 styles available: Straight, Box or Alcove. 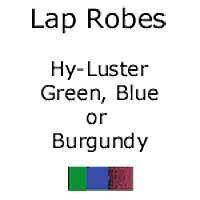 Lap Robes - made of 100% acrylic hyluster double faced will keep family members warm during cold weather. They are available in blue, burgundy or green as a 3' x 10' or 3' x 12'. Bar guards - Tent stake protectors. Minimum order eight. Safety/keeper pins - Available with chain or without. Minimum order six. 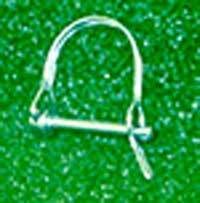 Aluminum Tent replacement hooks - Will fit most steel or aluminum frames. Minimum order one dozen. Tent guy ropes - White 3/8" polypropylene in 15' lengths. Sold as a set, each set consist of four ropes. Tent Bag - Each tent top is shipped with this bag. Our bag is constructed of heavy duty cotton duck and a vinyl bottom with your name on a label sewn in a clear pocket for identification purposes. Bag sizes: regular or jumbo. Tent Stakes - Several different sizes and styles are available. Item #20461 is a 7/8" x 36" stake without a point or head; made of hot rolled round steel for use under leg post. Item #20460 is a ¾" x 36" stake without a point or head; made of hot rolled round steel for use to tie down the tent top. Item #82019 is a 1" x 36" stake with a point and no head. Item #82024 is a ¾" x 36" stake with a point and double headed for use to tie down the tent top. Steril Corner Pole Steel Stake is 1 5/8" x 27" with a point and no head. Steril Ideal Sidewall Stake is 14" long made of heavy ductile iron with a rust-proof finish. Steril Velvet Nose Maul - is designed to drive both steel and wooden stakes without damaging the head of the stake. The maul head is ductile cast iron. Once face is plain for driving wooden stakes and the other is made of rawhide for driving the iron stakes. 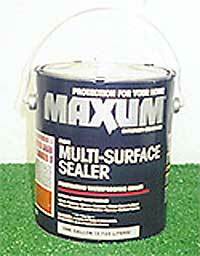 Waterproofing - multi-surface waterproofing sealer is a clear sealer that penetrates into dry porous materials and seals water out preventing water damage. Product is available in 1 or 5 gallon pails. McCourt Series 5 - Economical lightweight contoured polypropylene seats and backs are formulated with anti-static and ultra violet additives keeping the color true. The frames are 20 gauge, ¾" tubing, rear legs have a double riveted brace made from 23 gauge, 5/8" tubing. Injection molded high quality polyethylene feet. 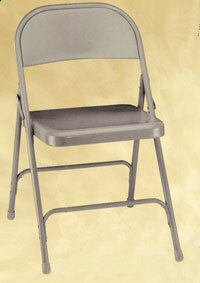 NPSC Series 800 - Premium lightweight folding chair that incorporates the strengths of a metal folding chair with the benefits of a plastic folding chair. The plastic seat and back are made of molded and contoured, color impregnated polypropylene plastic. These chairs won't fade or rust. The frames are electrically seam welded 18 gauge, 7/8" steel tubing, rear legs are supported with a U shape cross bar made from 18 gauge, 5/8" tubing which is attached by two rivets on either side. Four color combinations available. Packaged 4 per carton. 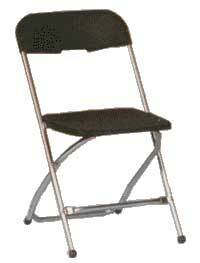 NPSC Series 50 - all steel folding chair features a 19 gauge 7/8" round tubular frame with 2 ½" frame strengthener on each side of the seat; two 19 gauge 5/8" U shaped double riveted cross braces. The seat has a waterfall front for added comfort. The back features a single contour with curled safety edges and is electro magnetically welded to the frame. Color coordinated V tip plugs for added stability. Beige, black, blue or grey available; packaged 4 per carton. 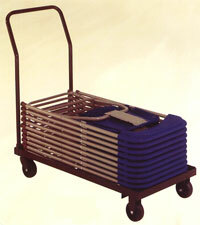 Chair Dolly - Made of 1/8" x 1 ½" x 1 ½" L shaped steel with a 7/8" round tubular handle and 4" polyolefin casters (2 swivel). 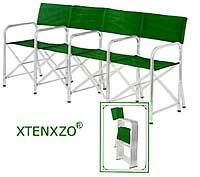 Xtenzo Accordion Seating - multiple seating chairs allow you maximum seating with minimum storage requirements. 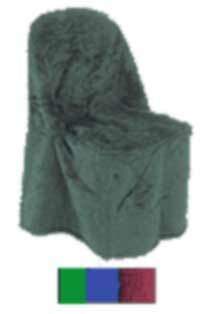 Use in any room where maximum seating is required or for temporary outdoor use. They are perfect for auditoriums, churches, schools, institutions and clubs. The units are available in 2 - 6 units; the frame is constructed of aluminum and the seat and back are a woven polyester fabric. Rust proof, telescopic leg action and non-tilt design leg action makes it self leveling. Chair Covers - made of 100% acrylic hyluster material. Washable and will not shrink. Monogramming is available. Choose blue, burgundy or green. 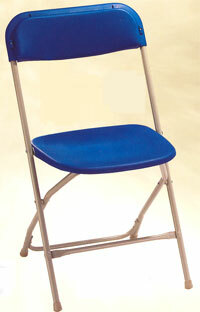 Chair Storage Bags - designed with or without compartments to hold four, six or eight folding chairs for easy transport. Each bag is constructed of heavy duty black cordura, with a drawstring closure and heavy duty nylon web handles. Grass Sets - synthetic poly sports turf has the look of real grass. Single pile tuft with a "Euraloc" backing will prevent water from pooling; mildew resistant. Maintenance free; easy cleaning rinse using water hose and hang to dry. Choose from 2 set types or custom orders available. Complete Grass Set - consist of two-6'x14', two-6'x8' and two-3'x9' with 3'x3' T pieces. Top Seal Set - consist of two-6'x14', two-3'x9' and two-3'x8' pieces. Customer Set - create your own set to suite your needs. Individual sizes are available - 6'x14', 6'x12', 6'x10', 6'x8', 3'x9', 3'x8', 3'x9' with a 3'x3' T or runners (3' wide x running foot). Cocoa Matting - reduces the danger of walking in unsafe conditions. 100% Coir; resist water and mildew. Available in 36" width and sold by the running foot; jute binding is sewn on the ends to prevent raveling. Custom widths and lengths are available. 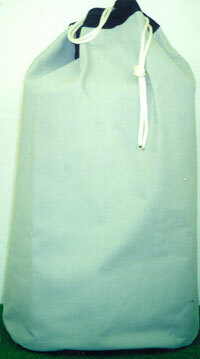 Tarps- 12' x 15' heavy duty OD green canvas with grommets. 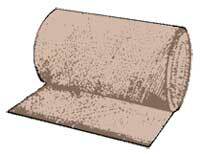 Custom 18 ounce vinyl coated tarps available with or without grommets. Aluminum Lot Markers - solid hand cast aluminum, with an 8" galvanized spike, raised 1" letters and numbers, various configured letter and number formats. Available: 5" x 5" w/8" spike, 4" round w/8" spike and 2 ½" x 5" w/8" spike. 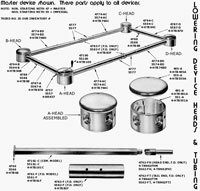 Stainless Steel Lot Markers - disk are made of stainless steel, with and 8" galvanized steel carriage bolt, various configured letter and number formats. Available: 3 1/2" or 4 ½" disk with bolt. 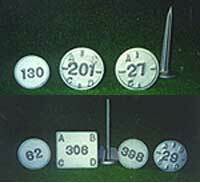 High Impact Polymer Lot Markers - durable quality polymer head with and 8" galvanized spike, various configured letter and number formats computer engraved. Available: 4" round w/8" spike and 5" square w/8" spike. York Style- 10" x 24"
Garden of Charity Rustic Style - 5" x 18"
Garden of Memory 7" x 24" 10" x 24"
#10 Round - 10" Diameter Sec 21 Lot A Or 14" Diameter Emperor Style - 6" x 24"
Veterans Sec. 4" x 21"
The Covenant - 42" x 42"
Laurel Hill Cemetery 24" x 32"
The Common - 36" x 48"
Portable Self Folding Traffic Guides - lightweight with a built in carrying handle for easy portability. Folds flat when not in use. 24" high x 10" wide. Chrome plated metal legs with rubber tips. Set of five include a free wall bracket for storage. Your choice of message or blank. Message: Funeral Parking Only, No Parking, No Parking with Handicap symbol, Please No Parking Funeral. Polyvinyl Traffic Cones - lightweight traffic cones are great for Controlling traffic. 28" high in orange with a black base. Available with "FUNERAL". Metal Vases - are available in green, with chip resistant finish in 4 different sizes. 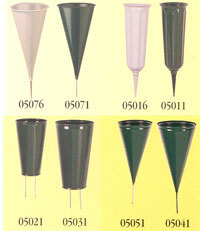 Plastic Vases are available in green and stone in 3 different sizes. Lawn Vases - have an outer casing that is set into the ground and when not in use, the vases reverse inside the casing to protect the unit from being damaged and exposed to the elements. 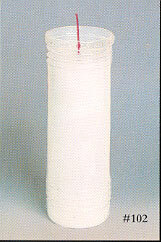 When in use, the vase can be exposed at ground level, half or fully depending on the vase. Portable memory lights are the perfect choice for use at burial sites, shrines, or outdoor grottos. The heavy duty top and bottom is made of gold anodized aluminum. 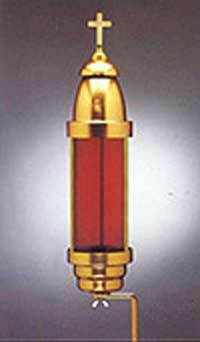 The cylinder is available is red, blue, green, amber, clear, purple, baby blue, baby pink or white. The top is available with a Latin cross, Eastern Rite cross or plain. 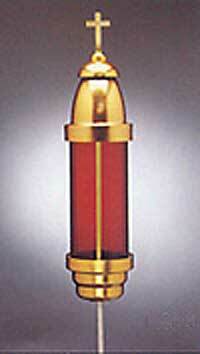 Memorial Light 1002 - features a 3/8" round off center ground stake. Memorial Light 1003 - features a pointed stake that slips between the headstone and the base. Replacement Candles 102 - plastic encased candles allow proper burning and are especially designed to fit the Memorial Light units. Candles are packaged and sold in 1 dozen or 2 dozen cartons. 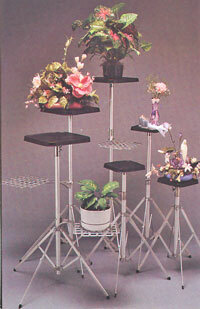 Adjustable Flower Stands - strong, yet light weight. Each stand will hold baskets up to 70 lbs. Interchangeable round heads, the shelf attachment locks onto the outside tube, at any height. Shelves are sold separately. 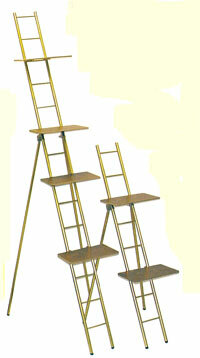 Ladder Flower Stand - polished gold anodized aluminum tubing, wood grain finished shelves. Available in three sizes and has an optional extension that quickly and easily adds additional display space. Carrying case sold separately. 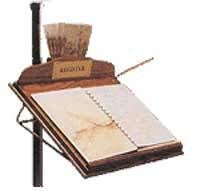 Accordion Flower Stand - portable and versatile makes these stands a must have. The heads of each stand can be used flat or tilted to any angle to hold baskets or sprays. Accordion style steel flat bars hold sprays firmly in place. Telescoping tripod stand offers versatility. Sold singly; carrying case available. Sod Lifter - easy turf removal; high grade wooden handle provides strength and durability; steel handle. Mighty Mack 2 Dump Trailer - two yard side dump off road. ›	Made of heavy 10 gauge steel and has a 6,000 pound test industrial axle with six lug wheels. ›	Heavy duty ball hitch, 2-5/16"
Mighty Mack 3 Dump Trailer - three yard rear dump off road. ›	Trailer - 2" x 4" tubular steel frame reinforced at stress points. Options: DOT ready with fenders, lights, tires, and electric brakes on one axle, springs both axles. Aluminum Grave Boards - all aluminum grave boards provide safe, sure footing for pallbearers and attendants. Not designed to hold vault equipment. Available with a smooth or grooved finish. 10'L x 14"W and 5'L x 14"W. Sold in pairs. Aluminum Grave Decks - all aluminum grave decks are designed and engineered for one, two or three-man loads. The preferred line for use as swing stages, scaffold planks or in conjunction with ladder jacks. Slip resistant decking, easy grip rungs are convenient for pulling or carrying the stages; safety molded Yellow handles. 1-Man decorator plank: 250lb working load, 8'L x 12"W 2-Man scaffold plank & stage: 500lb working load, 12'L x 12"W 3-Man stage platform: 750lb working load, 16'L x 20"W Other sizes and models available. Hawl Frost Remover and Dryer-removes frost and leaves the ground dry at the approximate rate of 1 foot in 3-4 hours. As it removes the frost the controlled application of heat conditions the soil for digging. Constructed of heavy gauge rolled steel sheet. Contractor's model burner, 200,000 B.T.U. 's with automatic regulator, hose and fittings. 94"L x 36"W x 12"H. Complete unit sold with Canopy, Carrier, Torch, and Fittings. IMPERIAL MODEL LOWERING DEVICE - Is a medium grade device, capable of bearing loads up to 700 pounds. 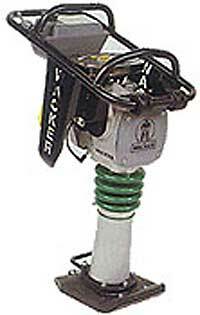 This device features an adjustable friction braking system giving you added control over the lowering speed. The Imperial is designed for one or two person setup and weighs 110 pounds without the placer arm assembly. The Imperial is available in 2 basic models: the cemetery model or the funeral directors model. Each model is available in chrome or stainless steel, with or without the placer arm assembly and both telescope from 62" x 25" to 94" x 38". MASTER MODEL LOWERING DEVICE - Is a high grade device, especially designed for everyday heavy duty use. The load bearing components of the Master are twice the size of those found in the Imperial device. The Master is capable of bearing loads up to 900 pounds. It is ideal for lowering a casket and fiberglass vault combo. (Use of steel and concrete vaults is not recommended with any casket lowering device.) The Maser is designed for two person setup and weighs 130 pounds without the placer arm assembly. The Master is available in 2 basic models: the cemetery model or the funeral directors model. Each model is available in chrome or stainless steel, with or without the placer arm assembly and both telescope from 62" x 25" to 94" x 38". 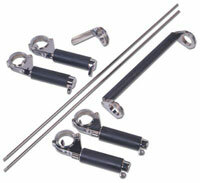 PLACER ARM SET - includes 4 placer arms, end roller, end stop and 2 guide rods. These parts apply to both the Master and Imperial cemetery models. TRIBUTE CARRIER (Casket Lowering Device Mobil Stand)- An all steel construction. Provides a quick, safe and effortless grave site set-up. Use of our stand will prolong the life of your device. Works with all casket lowering devices; side rails drop down and two of the four wheels have locks. Complete with tow bar, long channels. 40" wide x 95" long (208 lbs.) Drape is available in blue, burgundy or green hyluster. STREAMLINER BY FRIGID - is designed to work with casket lowering devices to give you a completely safe and mobile graveside setup. Complete with towbar and long channels. Drape is available in blue, burgundy or green hyluster. Cremation/Urn Collapsible Stand - Measures 36"W x 20"D x 33"L Stand: 1" x 1" 6063 grade aluminum tubing, 1/8" wall thickness with aluminum piano hinges. Platform: 1/4" masonite, covered in green artificial grass with non-directional pile or Hy-luster acrylic fabric . Drape: Hy-Luster acrylic fabric colorfast and machine washable. Available in burgundy, blue or green. crushed velvet available call for pricing. 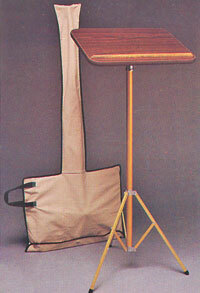 Storage Bags: One to store the collapsible table and platform. The other to store the drape.